Winter is a time of fun and frolic for people of all ages. Drivers find sheets of ice and snow a sight to behold, but also a cause for warning. You face out-of-the-ordinary challenges once you’re behind the wheel of your vehicle trying to navigate through icy roads. 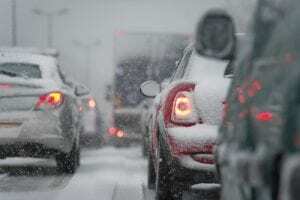 Increase safety and prevent accidents from happening with the help of these four safety tips when driving during winter. Check current outdoor conditions if it’s safe to drive. If the road is too slippery to drive or even walk on, then stay put inside your house. Still, if the weather permits you to drive then make sure you have a survival kit for winter in your automobile. The tool kit should include a snow shovel, an ice scraper, and road or sand salt. Tires. Check to see if you need snow tires or if you have to replace your regular tires with new models. Windshield wipers. Your car’s wipers should adequately work to ensure proper visibility while on the road. Windshield fluid. The reservoir should always have a windshield cleaning solution during the winter. Gas tank. Always keep a spare gas tank at the ready if nearby gas stations close early for the day. Also, keep your car in a garage instead of parking it in the driveway. The closed area helps keep water vapor at bay, which would otherwise freeze your vehicle’s gas lines. Last, run your car every few days even when you’re not using it to help avoid a dead battery. Slow down when driving on the road during winter to help prevent car accidents. Leave an extra distance between you and the vehicle in front of you to give your car a skid room. Traction is low when driving on icy surfaces so your automobile’s breaks might not work as good when maneuvering during the summer. Also, take it easy with the steering; avoid sharp cornering and drifting as much as possible as it might lead to your car skidding across the road. Use the highest gear available on your car’s system to help avoid wheel spins. Make sure to use a low gear when traversing downhill slopes and bends. If you need to slow down, use your brakes instead of just releasing your foot from the gas pedal. Stepping on the brakes activates the rear brake lights to warn motorists behind you. 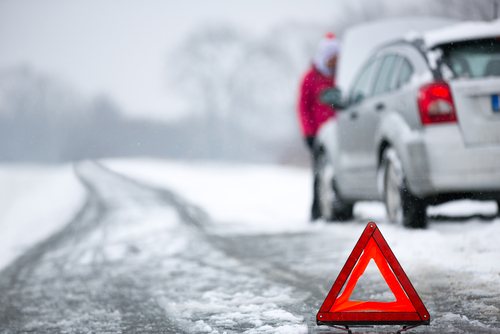 Black Ice is one of winter’s nastiest hazards. It’s difficult to see, and it’s almost transparent. Check for signs of Black Ice if the road looks glossier or more polished than it should. Drivers tend to overlook this phenomenon because it often seems like a harmless puddle. Keep your eyes peeled when going through shaded areas on roads as Black Ice commonly occurs in these locations. Other areas to consider for Black Ice activity include spots under trees and regions adjacent to walls. Don’t panic if you encounter Black Ice on the road. Keep as calm as possible and gently maneuver your vehicle to safety. Step on the brakes but avoid hard braking. Keep the steering wheel as steady as possible to help your car stay on the right lane and prevent accidents. Even if you performed all the preventive measures and drove as safely as possible, Mother Nature can still pull stunts on you that may break down your car. If you feel your automobile’s battery is about to die, quickly steer it to a nearby safe location. Call and wait for help to arrive. While waiting for assistance, use your car’s heating system to warm the engine for about 10 minutes every hour before aid reaches your destination. Don’t stay inside the car if ice or snow is blocking your vehicle’s pipes. Carbon monoxide might go back to the cabin, which can lead to carbon monoxide poisoning for you and other passengers. If you have to stay inside your automobile, slightly open the windows to avoid carbon monoxide buildup. According to a statistics report from the Road Weather Management Program of the US Department of Transportation’s Federal Highway Administration, there are over 116,800 injuries caused by vehicle crashes on icy or slushy pavements. You can minimize the occurrences of road accidents during winter by executing preventive measures before you start driving. Also, resist the temptation to speed up while you’re on the road. Drive slow during winter, and you can reach your destination safe and sound.